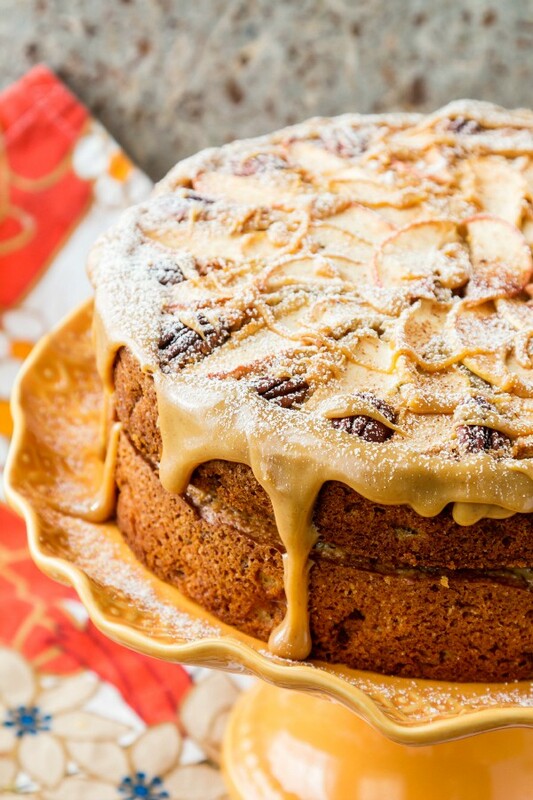 Y’all are going to love this spiced apple cake! 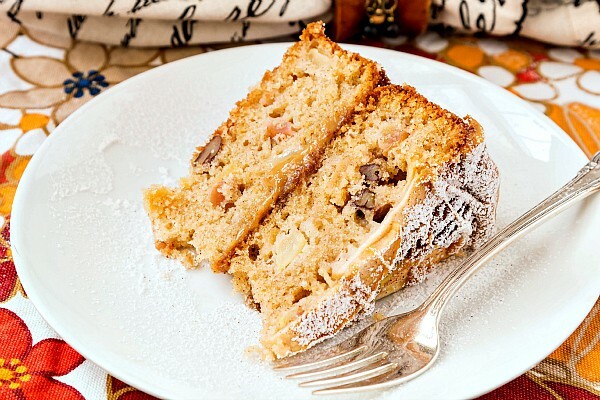 A tall and proud layer cake full of dried and fresh apples plus crunchy toasted pecans and drizzled with dulce de leche. 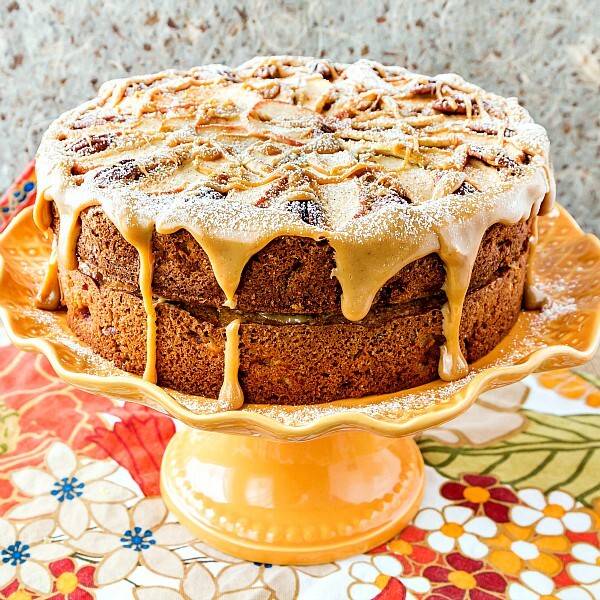 Thanksgiving is coming, you guys, and this cake is a great addition to your Thanksgiving dessert spread! 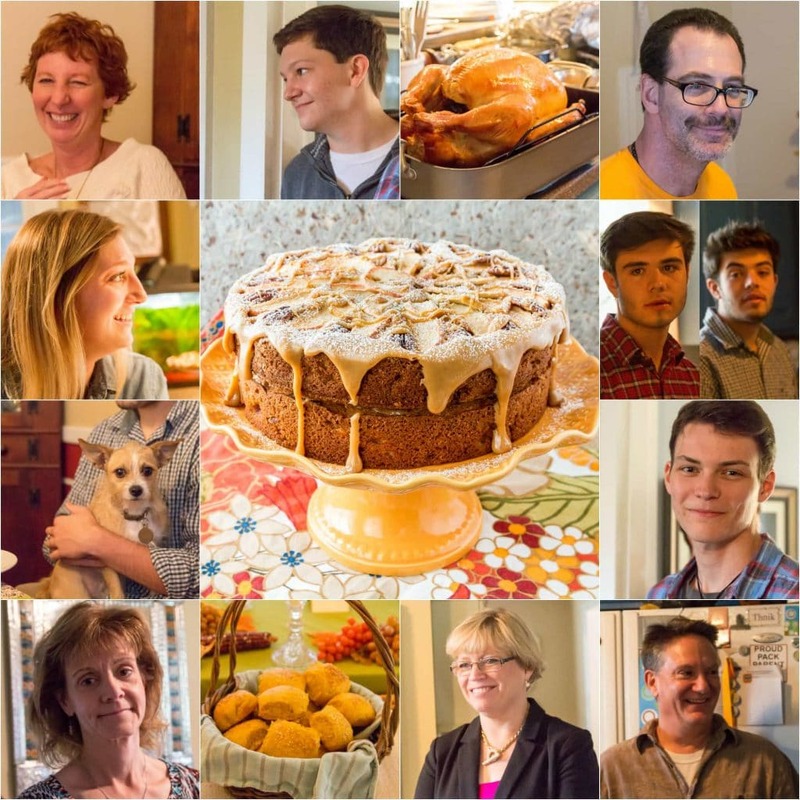 Before we get to ye olde apple spice cake, I want to introduce you to some folks. These are some of the people I love the most in the world, and I was truly blessed to be able to spend precious time with them yesterday, laughing and cooking and eating and enjoying each other’s company. See that laughing girl up there at the top left? That’s my best friend Julie who was lovely enough to extend the invitation a few weeks ago. Below her photo is her daughter Shellie. She’s a senior at NC State and I first met her when she was about 2 hours old. She has changed substantially since then and is a smart and talented young woman. The dog? That’s Grace. She’s Julie and Scott’s newest rescue. They drove hours to adopt her last year right before Christmas. She is an earnest mess. Lovely Cindy, Julie’s sister-in-law joined the gang as well. She never ages. Skip over those rolls for now and meet my new friend Colleen. Colleen is from Canberra, Australia, and is in the US working at the Australian embassy in DC. Julie and she have been friends for years. Aside from embassy work, Colleen is also a gifted seamstress and made several of Shellie’s Irish Dancing competition dresses over the years. That’s how Julie and she became long distance friends. And I finally got to meet her. Now we’re officially facebook friends. Yay! Scott is Julie’s husband, Cindy’s brother, my friend of thirty-five years and The Beloved’s brewing partner. He is the best. Above him, meet Patrick. I just met him yesterday. He’s a very cool kid and was a serious fan of the pumpkin rolls. He and James William are friends, and since not all families were conceived by Norman Rockwell, he has found his family with Julie and Scott. Above him are Cindy’s kids, Tyler and Stephen. Really nice young men, and Tyler especially gets extra points as he had to sit between Julie and me and hear about hot flashes. And of course, there is The Beloved. I have known him for thirty-three years and have loved him for most of that time. He is my best and only. Last but not least, meet James William, the younger of Julie and Scott’s kids. Over the course of seventeen years, I’ve watched him grow into a kind and compassionate young man. We also enjoyed hanging out with my mom and dad for a few hours later that day as well as with my friend Nadine (of Communion Bread fame), her husband Bill and their kitties, Mina and Josie. All in all, the day was pretty close to perfect. I hope your Thanksgiving was filled with love and good food and family, either family by birth or family of the heart. As soon as I knew we’d be eating with Julie, Scott and the gang, I started planning what I was going to make. I was charged with bringing macaroni and cheese, bread of some sort, some type of cranberry something and a dessert. Lots of latitude there. I love that, because I get to play. As I thought about what to make for dessert, I realized that there are a Dearth of apple recipes on the blog. Sure, there are a couple of apple butters and some apple sauce (do you detect a theme), but not even one cake. Bad me. I set about to Rectify that, and what I came up with is pretty spectacular, if I do say so myself. I started with Hubba Hubba Apple Cake as my basic recipe. I first saw this cake when my friend Theresa from The Food Hunter’s Guide to Cuisine featured it for September’s Progressive Eats theme, apples. The original recipe comes from Gina DePalma’s family. 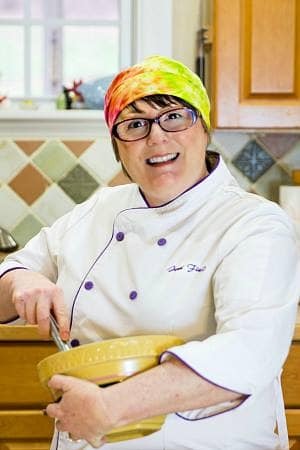 DePalma is the former pastry chef at Mario Batali’s Babbo Restaurant, so if she says it’s delicious, it’s a pretty safe bet that it is. And while I’m not trying to take anything away from DePalma’s version, I thought it was perhaps a bit rustic for Thanksgiving. My plan was to gussy it up a bit and serve something more refined and holiday-worthy. I think I’ve succeeded, and while I’ve not had the original version, I am here to tell you that everyone who tried this cake was pretty smitten. It’s not too sweet. 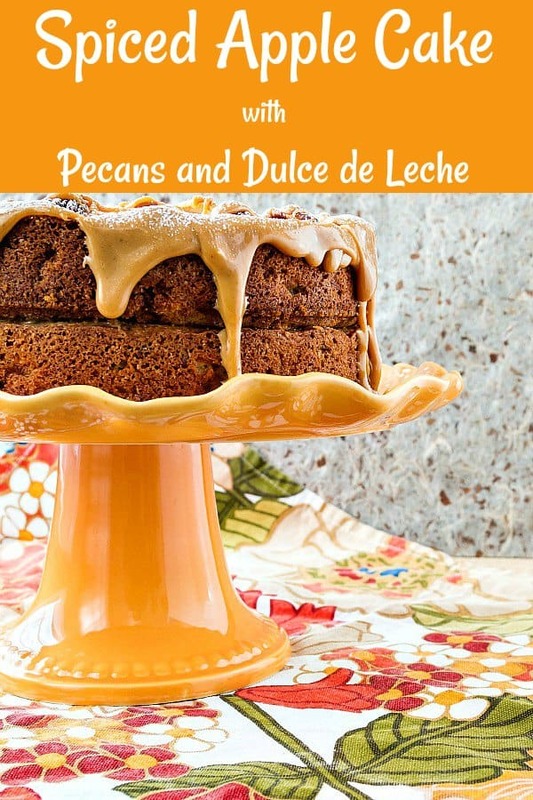 The spicing is restrained, the apples and pecans work beautifully together and the dulce de leche glaze was, literally and figuratively, the icing on the cake. Before I share my recipe, let me tell you my modifications so you can see what I did and how I did it. I hope it will give you permission to play with other recipes to come up with your own spins on them. First, rather than baking in a tube pan, I baked in 2 9″ x 2″ round cake pans. The original recipe calls for sprinkling the apples with cinnamon and sugar and then layering them in with the batter, half in the center and half on top. I chose to put the sugar, cinnamon and apples right in the batter along with a healthy measure of chopped, toasted pecans. The liquid called for the in the original recipe is orange juice. But since it’s not an orange cake, I used apple cider. I traded out all oil for half butter, half oil. I also went with both dried (plumped in hot water) and fresh apples, because I like the particular chew dried apples bring to the table. I also enhanced the cinnamon with freshly grated nutmeg and just a hint of ground ginger. Last, and just because I thought it would be pretty, I decided that naked cakes–which are a Thing now, I guess–didn’t have to be completely naked. Why not embellish the top layer with some artfully arranged ingredients that hint at the flavors within? I think it turned out beautifully. Hooray! This is a gorgeous cake, you guys. I hope you enjoy it! Like most of the recipes I share, even if they look fancy, you don’t need a ton of fancy equipment to make them. This cake is no exception. Here are my recommendations for some ingredients and equipment that can make your life a bit easier, though. If you love the sound of this recipe, please consider rating it and/or commenting. I love hearing from readers! And if you make it (and I hope you do) please share a photo with me either on instagram by tagging @onlinepastrychef and using hashtag #pcorecipe or in the Pastry Chef Online Facebook group. I can’t wait to see your version! 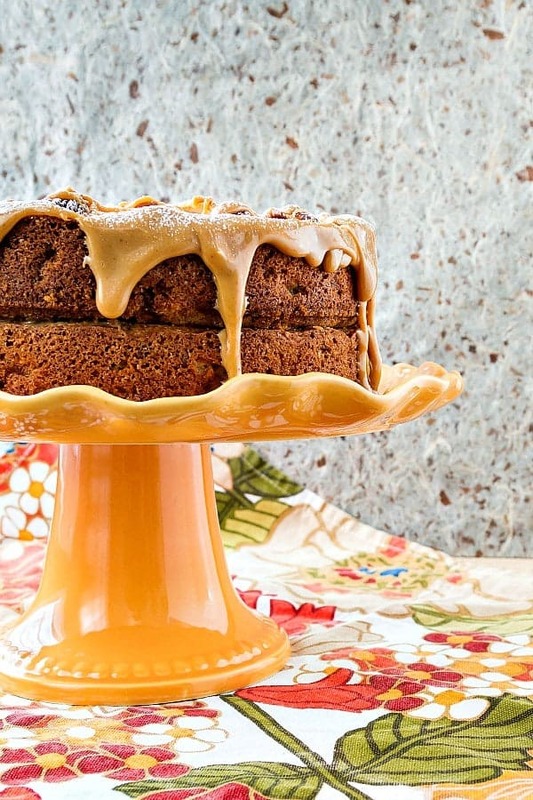 This spiced apple cake recipe is both rustic and elegant. This is a perfect, not-too-sweet, colder weather apple dessert. It's fancy enough to serve at a holiday event but would be just as at home for your coffee break. Make the bottom layer in a 9"x2" cake pan, and bake the top layer (the one with the apples and pecans arranged on top) in a 9"x3" springform pan so you don't have to turn the cake out and risk ruining the design. As always, all measurements in ounces are by weight and not volume. Please buy a scale. You won't be sorry. Line the bottoms of a 9"x2" round cake pan and a 9" springform pan with parchment. Spray the parchment and the sides of the pans well with pan spray. Set aside. Soak the dried apples in very hot water for about 10 minutes. Drain and squeeze out a fair amount of the liquid. They don't need to be bone dry, but you don't want them any wetter than a fresh apple would be. Chop them into about 1/2" pieces, and set aside. Wash and dry the fresh apples. No need to peel. Cut 2 1/2 apples into medium dice. Set aside along with the remaining apples. In a large bowl. whisk together the sugar, cinnamon, nutmeg, ginger, salt, flour and baking powder until evenly combined and light. In another bowl, whisk together the butter, oil, apple cider and eggs. Mix in the toasted, chopped pecans, the diced apples and the chopped dried apples. Stir well until evenly combined and no wet flour or sugar remains. The batter will be fairly stiff. Divide the batter evenly between the two pans and smooth the tops. Slice the remaining apple into thin half moons (about 1/8" thick). Arrange them decoratively on top of the layer in the springform pan. Add some pecan halves as well. Be creative. Bake in the center of the oven for 40 minutes. The unembellished round should be ready at this point. The internal temperature of the layer should be 200F. Remove that layer and continue baking the embellished layer another 20-30 minutes more, depending on your oven. You may want to cover the pan if the fruit or cake is browning too much, and check the internal temperature every 5 minutes or so once it gets up to about 180F. if you don't have a thermometer, the cakes will both be firm to the touch, golden brown on top and will have started to shrink from the sides of the pan just a bit. Cool each layer for 10 minutes. Run a thin knife or small spatula around the insides of the pan to make sure the cakes will release cleanly. Turn out the bottom layer and reinvert to cool top-side up. Carefully unmold the top layer from the springform pan. Warm about 2/3 of the dulce de leche so it is easily spreadable. If it seems a bit too stodgy, heat a tablespoon of milk or half and half along with it and stir until smooth and spreadable. Cut any dome off the bottom layer with a serrated knife. Eat it immediately. Spread the dulce de leche evenly over the top of the layer, all the way to the edges. Place the top layer on top of the dulce de leche and press down gently to make sure they stick together. Heat the remaining dulce de leche, adding a bit of milk if necessary, and drizzle a bit over the top. Spoon most of it around the edges of the cake so it runs down in Artful Drips. I mixed some powdered sugar with some cinnamon and dusted the top of the cake with that. You can you that or not. And there you have it. Spiced Apple Cake that started life as Hubba Hubba Apple Cake and now bears little resemblance to the original. I am very happy with my modifications, and I hope you feel like you can make your own modifications. Add some chopped cranberries to the batter (in which case, using orange juice or at least some orange zest in the batter might be lovely). Switch out the pecans for toasted walnuts, if you’d rather. Use some brown sugar in place of some or even all of the white sugar–if replacing all the sugar for brown, add a 1/4 teaspoon baking soda in with the dry ingredients to balance the acidity in the molasses. 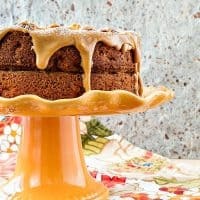 Frost with caramel frosting or maybe cinnamon cream cheese frosting rather than leaving it naked or drizzling with dulce de leche. Make this cake your own and then come show it to me! Unless you eat it all first. I hope your Thanksgiving is filled with fun, friends, family and delicious food. I am always thankful that you choose to spend some time here with me. Take care, and have a lovely day. Apples and dulce leche combined in one dessert?? Count me in. These are all of my favorite flavors :-). I love the idea of using dried and fresh apples! Gosh I wonder if I could do some kind of honey glaze and serve this for Rosh Hashanah!!?? And um, I really want a piece right now with a cup of tea. Dang it. Ooh, that would be perfect, Beth! And the perfect accompaniment to a cup of tea! This looks crazy good! I don’t think I could stop myself with just one slice, though! 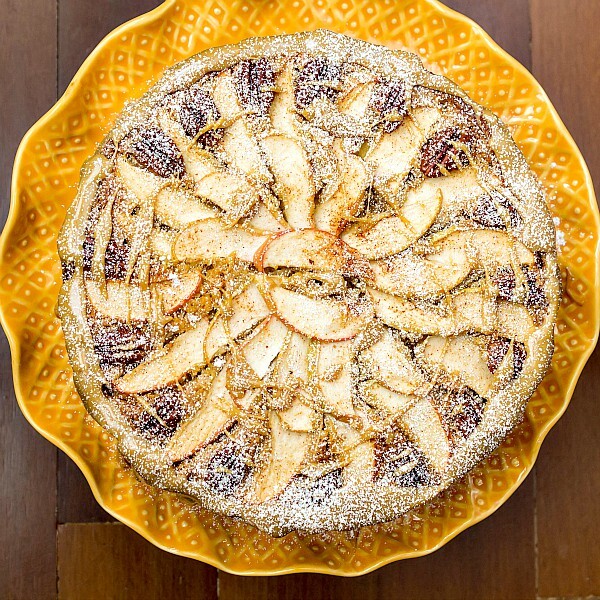 I love the idea of using both dried and fresh apples in this cake. I am about to go forage some apples from the neighbor’s tree, so this will be a great recipe to make.